Home again in one piece! Whew – after a whirlwind tour of East Asian airport (Japan, S. Korea, China!) I’m back at home and awaiting the arrival of my samples from the cruise! I’ll be looking at the amount and composition of the organic carbon in the sediments and rocks we collected from around the hydrothermal mounds and evaluating how they change both spatially and with the abundance/diversity of micro-organisms. So we’re coming down to the last few days of the cruise and we’ve finally had successs drilling at the hydrothermal mound site. We didn’t succeed in drilling right through the top of the mound, but we’ve drilled just 20m away at the side of the mound. 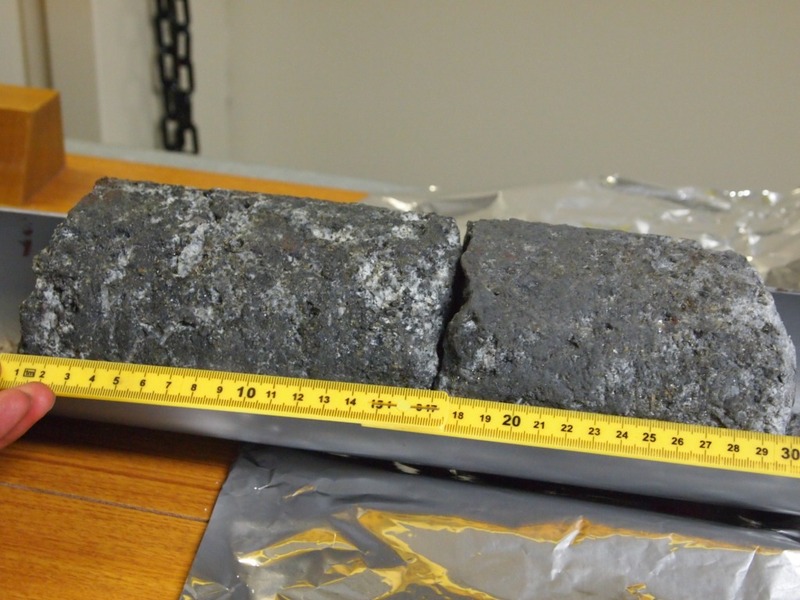 Our successful recovery was about 2m of heavily altered rock – no sediment. We’re now preparing to core again at this same site. But altered rock is good! 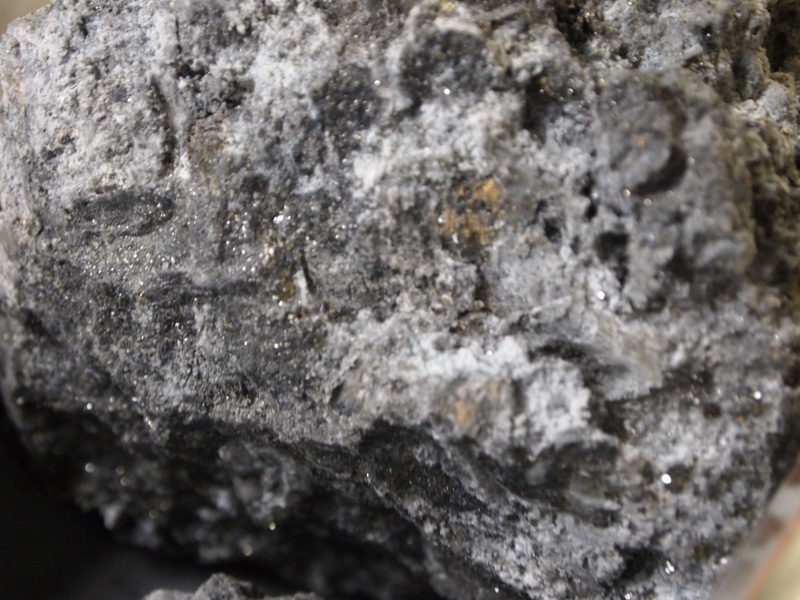 According to the geologists it looks rhyolitic… even the geochemists can see that it’s full of sulfide minerals, including pyrite. There was much rejoicing about this sample and even before it’s analyzed people are speculating about it! The microbiologists are also hard at work preparing to study any organisms that might be living in or on this rock! So over the last three days we’ve drilled down 130m at our latest site. This site has thick sediments overylying hydrothermally altered mud and rocks. There’s methane, hydrogen and hydrogen sulfide present at various depths which bodes well for microbial activity at this site. We’ve had good core recovery (sometimes as high as 80-90%) so that means we also have a lot of meters of core to work with. When we don’t have good recovery, we can drill a deep hole, but we don’t collect much core. The microbiologists have been counting cells and setting up enrichment cultures to try to figure out what organisms are living here. 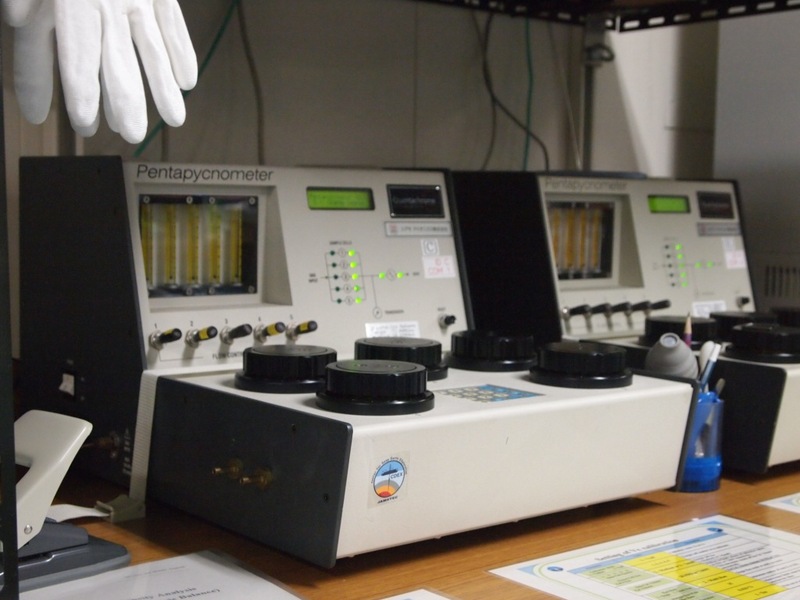 The geochemists have been collecting water and sediment and making measurements of a variety of dissolved and solid phase species (major ions, trace metals, alkalinity, carbon/nitrogen/sulfer). 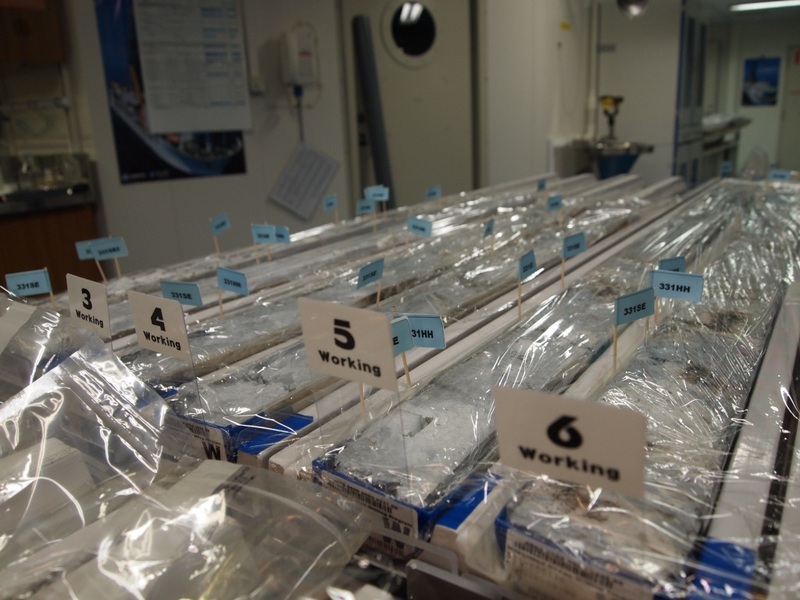 We’ve also been ‘logging core’ which means sedimentologists and petrologists spend many hours visually inspecting the core and doing microscopy and x-ray diffraction analysis to determine what minerals are present. I’m stilll measuring physical properties that provide context for all these other measurements and collecting samples to bring home for organic carbon characterization. This is funnier if you have read the post from Sept 14th!! 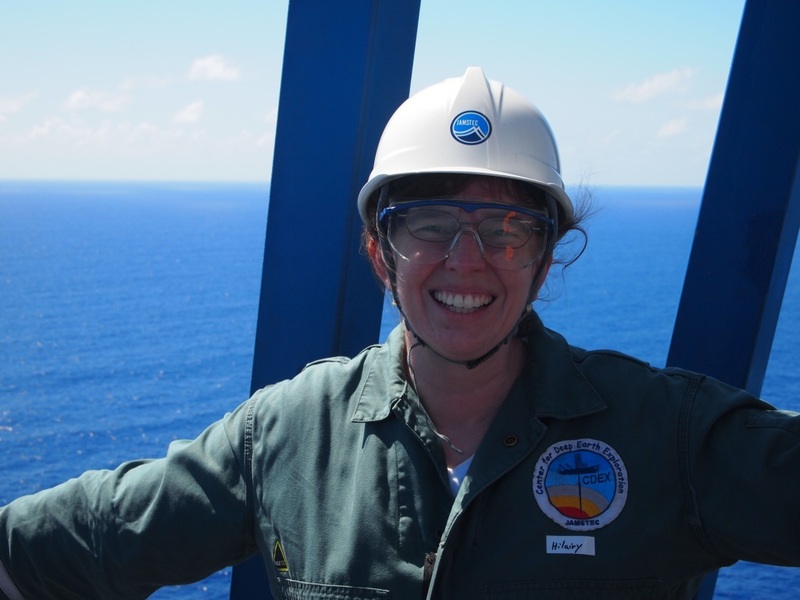 Calm seas and no cores could mean just one thing – a derrick tour! 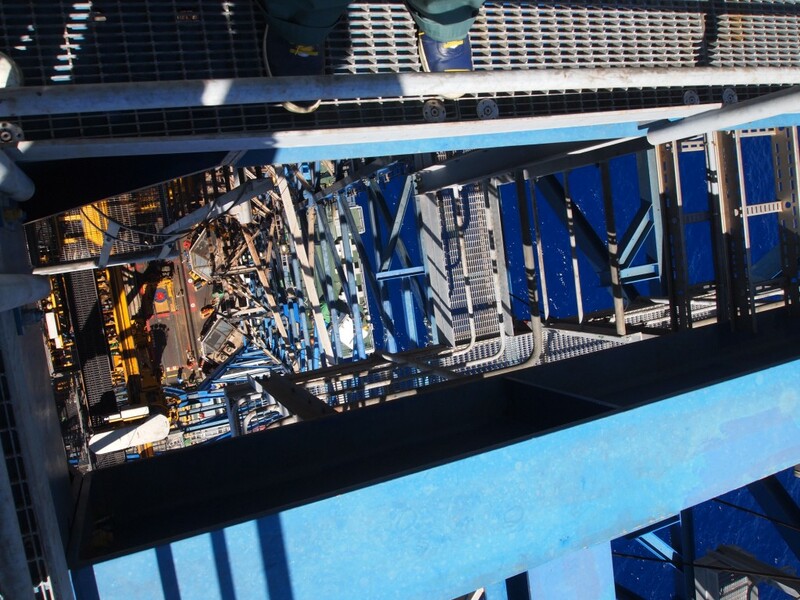 The drilling derrick is 70m above the deck. That’s about 230 feet up! It’s pretty airy – the platforms are all grating and you can see right through them to the ocean and the ship below. It was pretty amazing – you could see the curvature of the earth from up there! 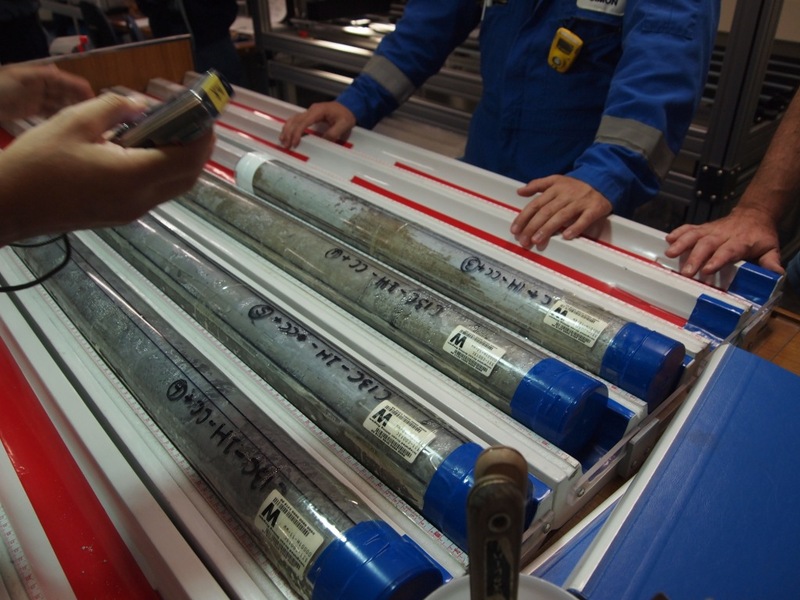 So site 2 has been everything you could wish for on a drilling operation…we’ve collected more core and more samples from those cores in the last two days than we did in the first two weeks of the cruise! So now, after 3 consecutive 15h days I have a spare moment to myself. The second site as I mentioned is further off the flank of the volcanic zone. It’s not quite as hot, and it has thicker sediments – so we havn’t melted the core liner and there is more hope for microbes! We’re still waiting to see the results of the cell counting and from the sediment and porewater geochemistry – but it’s quite exciting. We “stopped” in Okinawa today, actually about 3km off-shore, to change over some of the ship’s crew and the technical staff. Now we’re heading back to the first site to do some more coring. 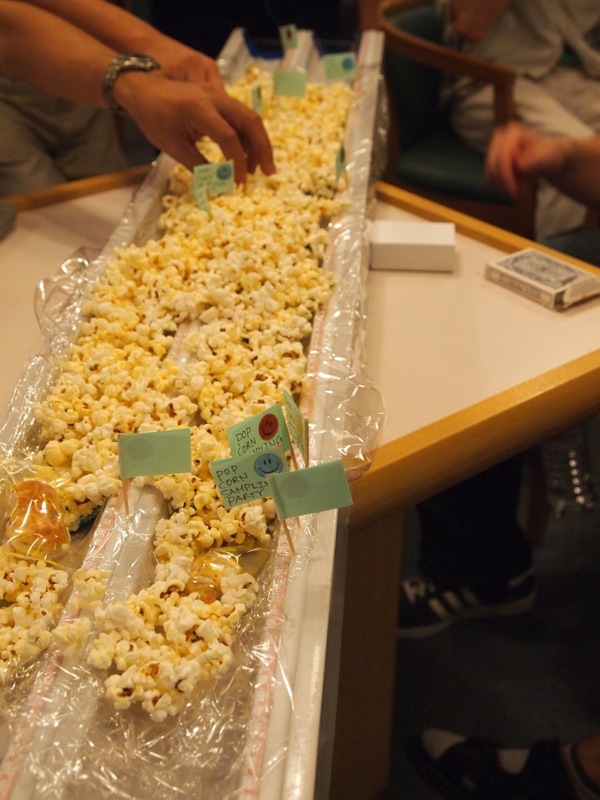 We’ll have a second sampling party tomorrow and then get back to coring operations. We’re one day past the half-way point and things are going pretty smoothly! 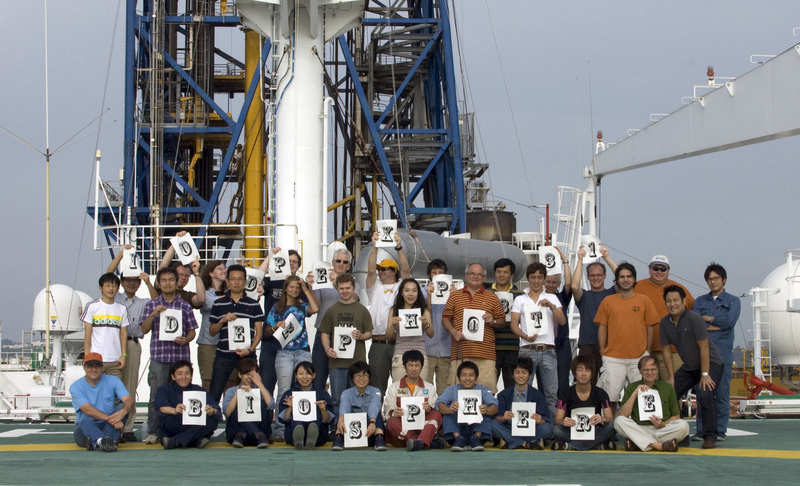 So things are busy here on the Chikyu – we’re now at our second site. This one is a little further off the flank of the volcano on the seafloor. Our hope is that this site is not quite as hot as the last one (we’d like to stop melting the plastic core barrels!). We’ve drilled two holes so far and have seen very nice sulfidic sediments. That suggests there’s an active microbial community, but we’ll see how deep these sediments go. 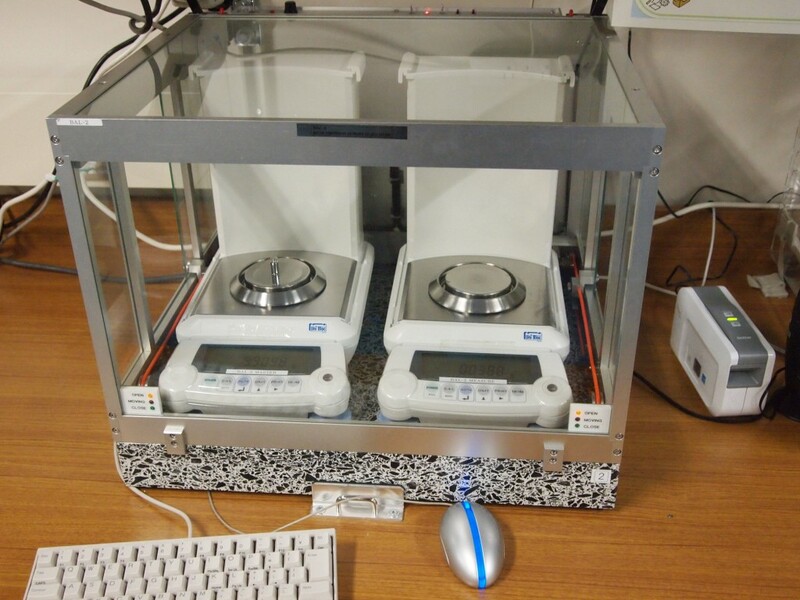 I’ve been busy preparing samples for density analysis…here’s a picture of the pycnometer (pycno is the greek root for density)! They also have this cool system of paired electronic balances…it’s hard to weigh things at sea because the rolling of the ship affects the weight on the balance. With two balances, you can compare the difference between the two of them more accurately (essentially you assume the role of the ship affects them both equally) and do some averaging to get pretty good mass estimates. There’s more cores on deck so it promises to be busy for the next day or so! We have been coring pretty much continuously for the last few days. We’ve drilled in 4 locations and collected 15 separate cores (each one has multiple sections) our greatest depth reached thus far is about 55m below the seafloor. 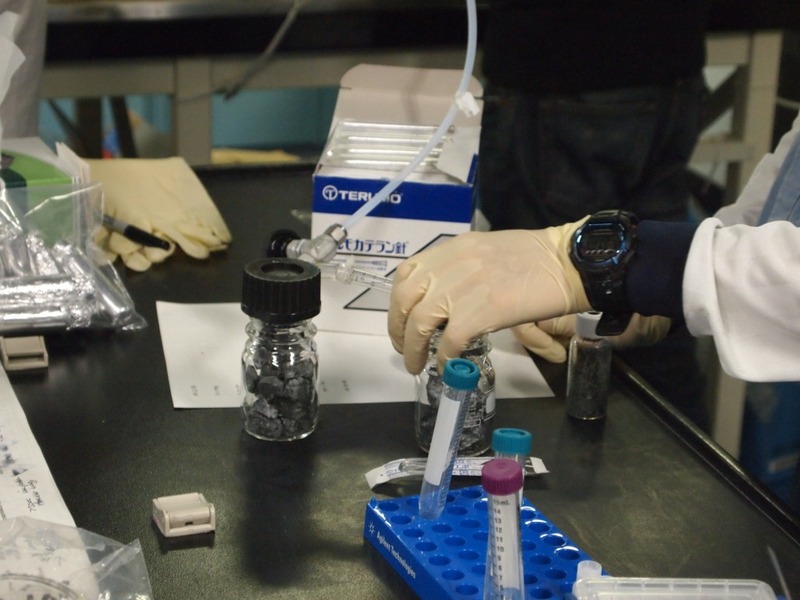 While we collect a lot of samples routinely for shipboard analyses and for analyses that are time-sensitive, there are also a lot of samples that get collected periodically at a sampling party. 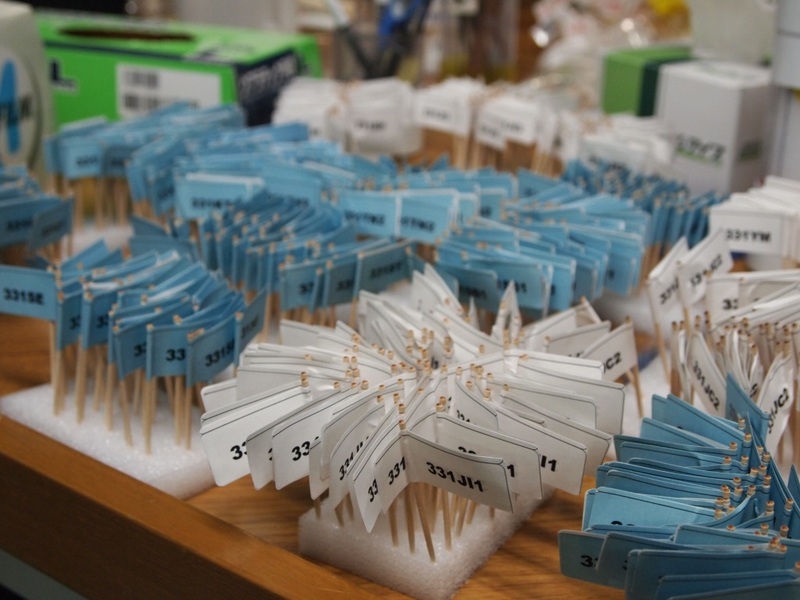 All the cores get laid out in the lab, all the scientists get a set of flags, and everyone has a few hours in which to decide where in each core they would like samples. The curators will log all of the requests and then we go back and collect the samples from the working half of the core. 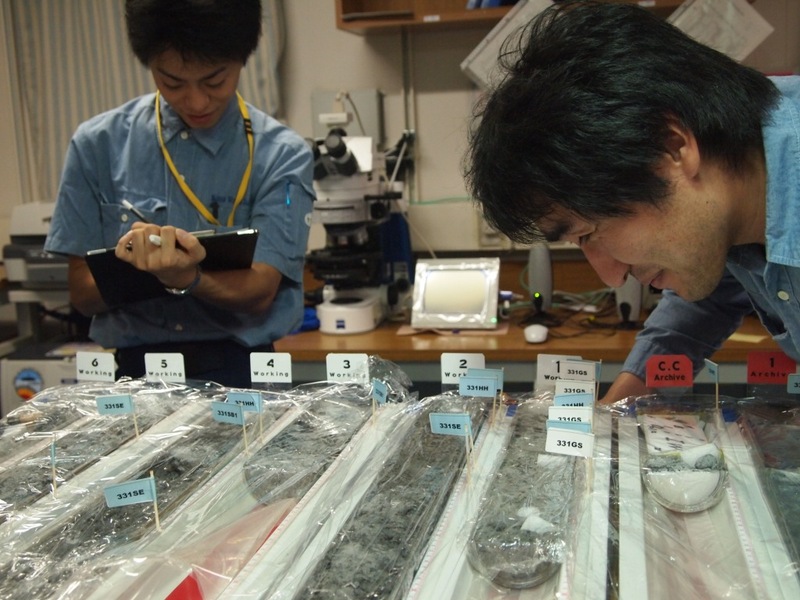 There is also an entire archived half of the core that will be stored at an IODP repository in Japan. 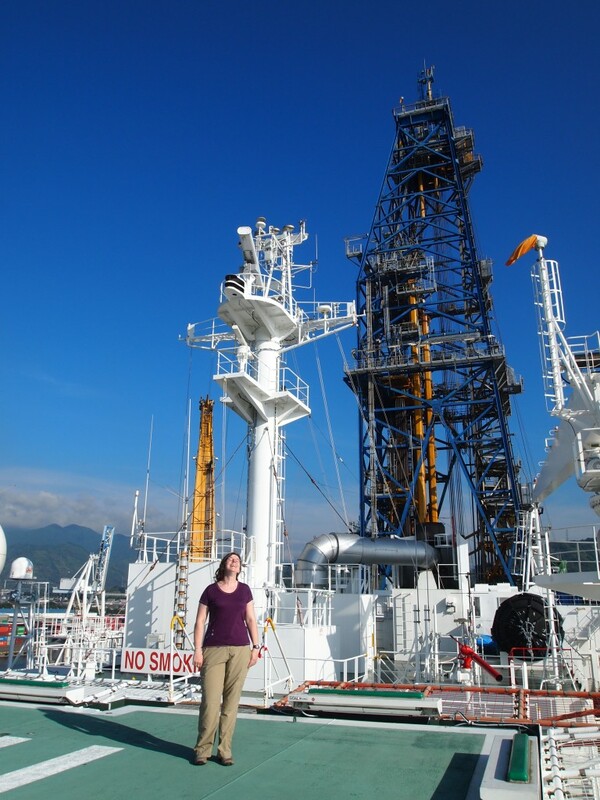 One of the great things about IODP is that people will be able to request samples from the archive in the future. 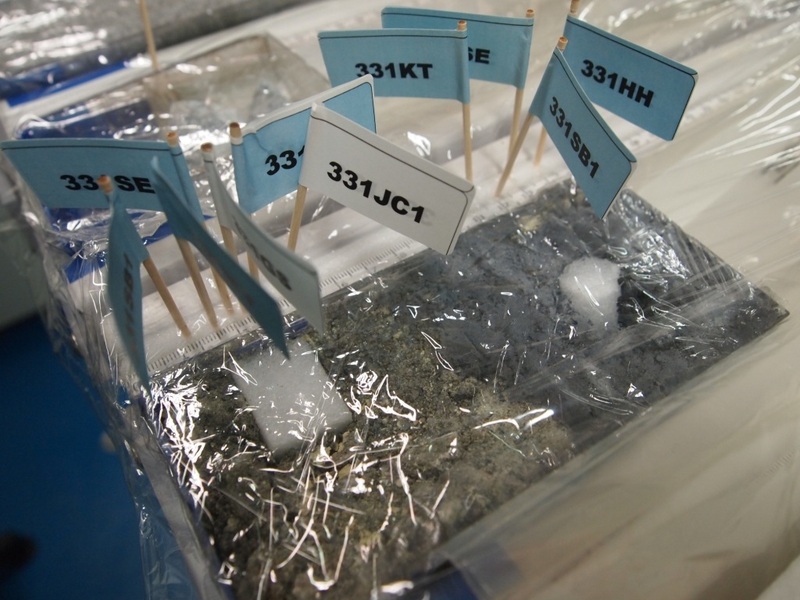 Sometimes there is a very popular section of core, with many sample requests…when that happens the curators and the chief scientists have to discuss how samples of the core will be allocated. Now that's a popular section of core! Wow, Hil, you guys really know how to party! When you get home you can help us aerate our lawn and we can really get down and dirty! Just kidding, you know–we are finding all of this fascinating and LOVE your photos–great job. That’s the cry that goes out when there is a core coming up from the drill rig. We’re all very happy to have been hearing that a lot in the last couple of days. We’ve drilled 5 holes, the last three of which have had 4-5 cores each. Each core has several sections (as many as 8 sometimes), so that amounts to a lot of core. 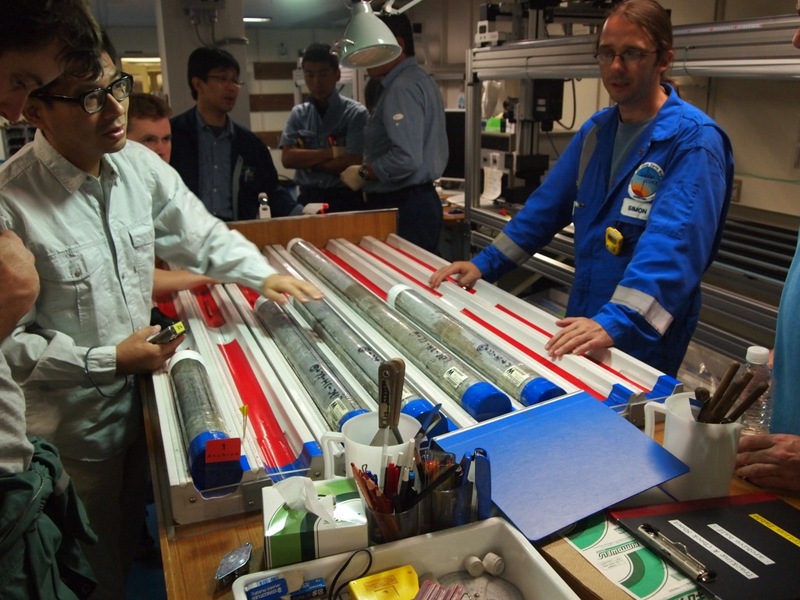 The cores get examined for lots of things…this picture has the sedimentologists and geochemists looking at sediments and talking about whether the minerals we see are hydrothermal in origin or whether it is just some kind of non-hydrothermal process. The bulk of what we’ve seen so far are sulfate minerals like anhydrite, gypsum, and pyrite. We’ll know more about the mineralogy when we’ve made thin sections and looked at x-ray diffraction patterns. Some of that will happen over the next few days, some of that will happen in labs back at home. On the plus side, we’ve started coring. Unfortunately, things have not been going very smoothly. We’ve had two failed attempts at getting a 9m piston core. The substrate is harder than anticipated (it’s basically rock and not sediment) which is not good for this type of coring. 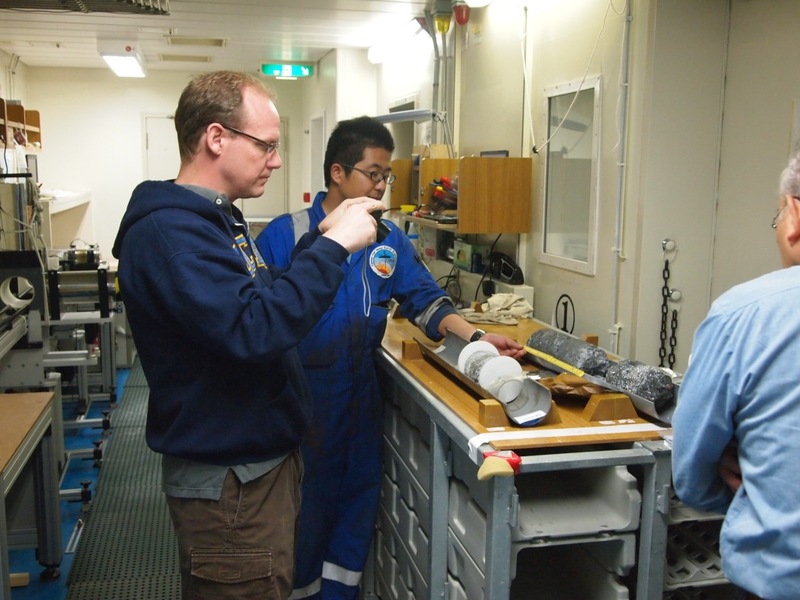 The first time we didn’t get any core penetration, the second time we did, but then broke the barrel of the piston core, leaving about 4m of core barrel and a temperature sensor embedded in the seafloor (insert your favorite expletive here!). The bottom of the piston core was bent at about a 45 degree angle, so we could not just pull it up through the center of the drilling string. 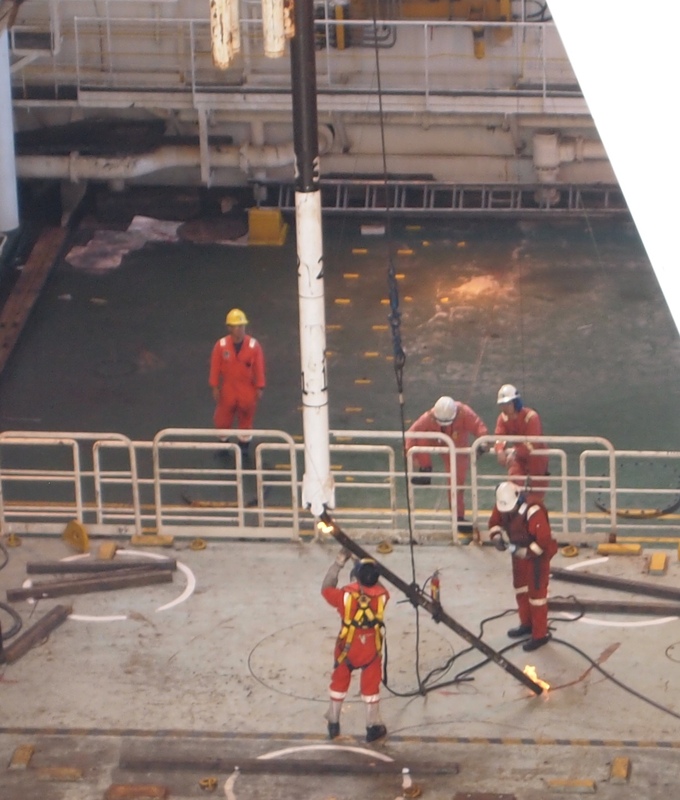 They had to pull the whole drill string and once it was at the ship, cut the bent part of the piston core away to get the drill string up to the rig deck (it has to go through a 5-6ft diameter hole). You can see clearly from the picture why they had to do this. They used an oxy-acetylene torch to cut the bent part of the core barrel away. There is flame at both ends because the plastic core liner inside of the barrel caught fire in the process. It looks exciting, but from a science standpoint this is a real setback. 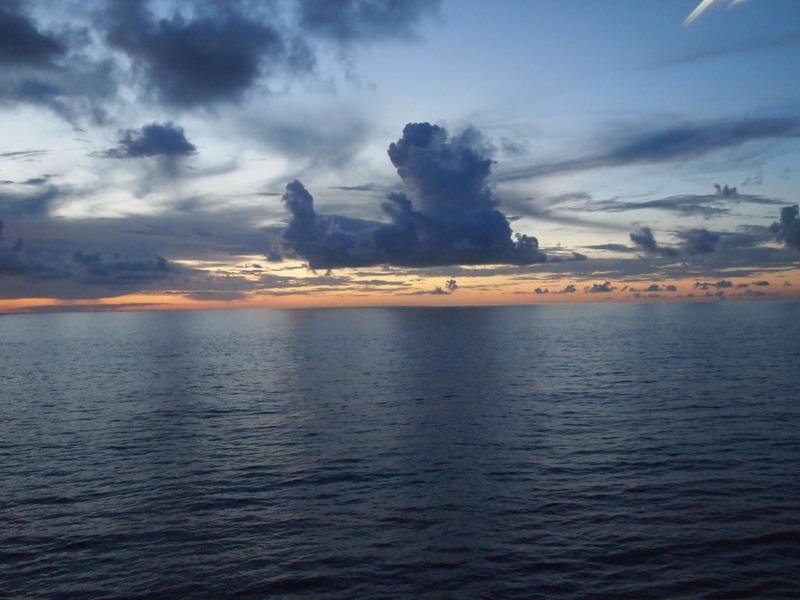 Latest report is that we will reset everything (we’ve got a spare piston core) and try again – hopefully there will be a core on deck by 8p or so (about 6h from now). ...definitely not part of the plan! 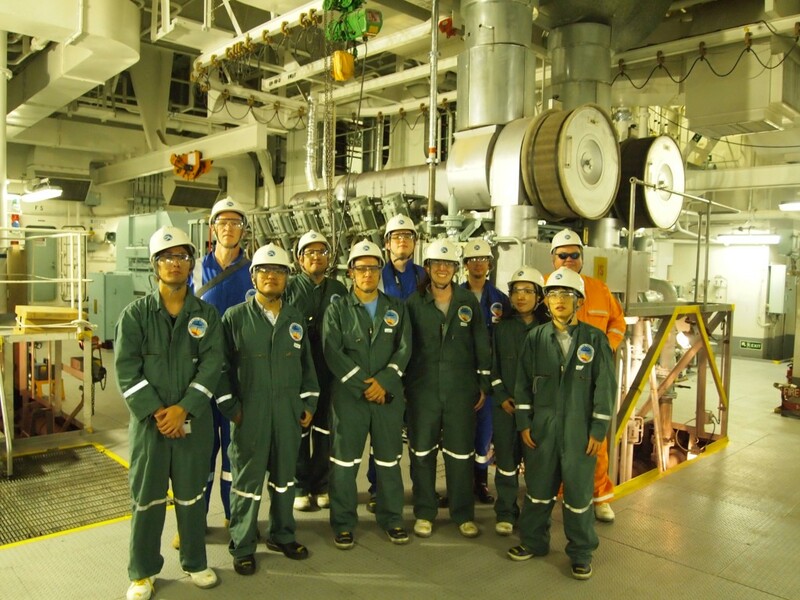 On the engine room tour we learned that the ship uses 500-1000 tons of fuel each day that we are steaming! That’s quite a lot! 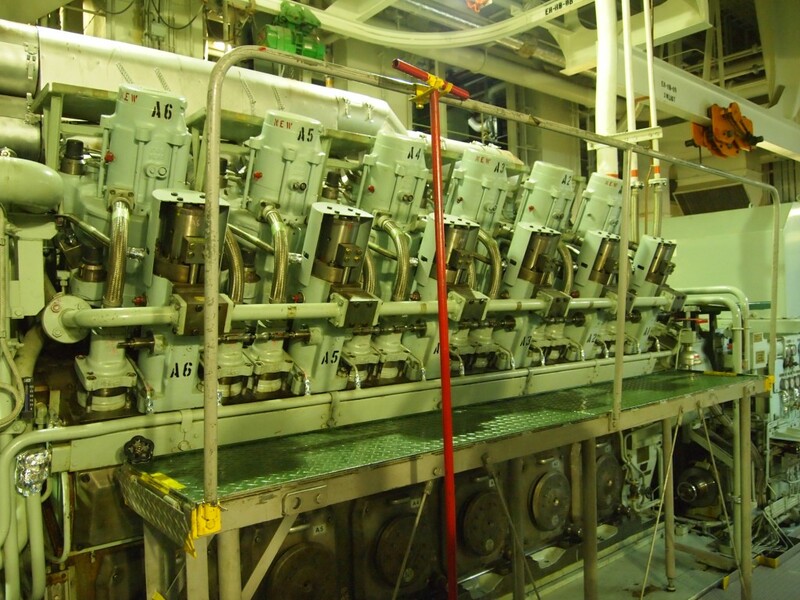 There are 6 main and 2 auxilliary engines that can generate 35,000 Kw of electricity. Enought to power a small town! And with 200 people on board, that’s pretty much what we are. The engine rooms were very loud and incredibly clean! 500-1000 tons of fuel each day ???? ?